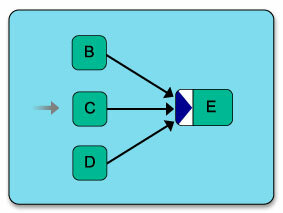 The Workflow library provides a method of running Finite State Machines with memory. It can be used to execute a set of methods, complete with conditions and patterns. Workflow allows for a number of independent pieces of data to be processed by the same logic, while allowing for the entire process to be forwarded, backwarded, paused, inspected, re-executed, modified and stored. In the following sections we will take a look at Workflow’s features by working on examples of increasing complexity. Please keep an eye out for comments in the code as they provide crucial information. Instantiate a workflow engine. For this example we will use the simplest provided one, but you may also extend it to add custom behaviour. Create tasks. These are purpose-built function functions that the workflow engine can execute. The engine always passes (current_token, current_engine) as arguments to these functions, so they need to support them. Note the add_data function needs to be able to accept more arguments. For this we use a closure. """Print the data found in the token.""" Create a workflow definition (also known as callbacks). This is a (sometimes nested) list of tasks that we wish to run. Define tokens. This is the data that we wish to feed the workflow. Since the data we will deal with in this example is immutable, we need to place it in token wrappers . Another reason you may wish to wrap your data is to be able to store metadata in the object. Run the engine on a list of such wrappers with our workflow definition. The engine passes the tokens that we give it one at a time through the workflow. # The engine prints: "1\n2"
Bonus! Once the engine has ran, it can be reused. # The engine prints: "2\n3"
How control flow is done. We provide, among others, IF_ELSE and FOR statements. They are simple functions - therefore you can make your own if you wish to. We will see examples of this in the Details section. Control flow can reach outside the engine via exceptions. We will raise the WorkflowHalt exception to return the control to our code before the workflow has even finished and then even resume it. Add [0, 1] at the end of the list. Repeat a until list >= [0, 1, 0, 1]. Add  when we are done. Time for some code! Let’s start with the imports. Pay close attention as their arguments are explained briefly here. # is the code that runs in the loop. # inspected, resumed, restarted, or other. IF_ELSE,    # Simple `if-else` statement that accepts 3 arguments. Now to define some functions of our own. Note that the first function leverages eng.extra_data . This is a simple dictionary that the GenericWorkflowEngine exposes and it acts as a shared storage that persists during the execution of the engine. The two latter functions wrap engine functionality that’s already there, but add print statements for the example. """Append data from a given `key` of the engine's `extra_data`.""" This is not handled by the engine and bubbles up to our code. """Restart the engine with the current object, from the first task.""" # "if obj < [0,1,0,1]:"
# "return back to the FOR"
Because our workflow interrupts itself, we will wrap the call to process and restart , in try-except statements. # allows us to access them via `my_engine.objects` later. # has finished with all objects). Celery is a widely used distributed task queue. The independent nature of workflows and their ability to be restarted and resumed makes it a good candidate for running in a task queue. Let’s take a look at running a workflow inside celery. # `app` is required by the celery worker. # Define a couple of basic tasks. # Create a workflow out of them. # Mark our execution process as a celery task with this decorator. # it since our code will not be running in the global context. # distributed and when they run. You should see the worker working. Try running python workflow_sample.py again. A front-end can be attached to the engine with ease. Workflows can be stored for resume at a later time..
..or even shared between processing nodes. In this example we will see a simple implementation of such a database-stored, resumable workflow. Note that the Workflow model below can store an element pointer. This pointer (found at engine.state.token_pos ) indicates the object that is currently being processed and saving it is crucial so that the engine can resume at a later time from that point. """Save object to persistent storage.""" The transition_exception_mapper can look confusing at first. It contains not Exceptions, but methods that are called when exceptions with the same name are raised. Save the first objects that it is given. when there is an expected failure. For now, all we need to know is that in our example, HaltProcessing is an exception that we will intentionally raise and we want to save the engine when it occurs. Once again, follow the comments carefully to understand the code. """Load an old `token_pos` from the db into the engine.""" # And now we inject it back into the engine's `state`. # previously, so we override `save` to do that. """Save the state of the workflow.""" # have subclassed it below. """Processing factory for persistence requirements.""" """Define our for handling transition exceptions.""" # that have been passed to the engine, if they aren't already stored. # We wish to save on every successful completion of a token. """Save after we processed all the objects successfully.""" # is going to be an expected situation. that we don't lose the state.""" And now, for the problem that we want to solve itself. Imagine an fictional exam where a student has to take 6 tests in one day. The tests are processed in a specific order by a system. Whenever the system locates a failing grade, as punishment, the student is asked to take the failed test again the next day. Then the checking process is resumed until the next failing grade is located and the student must show up again the following day. # regardless of the outcome. The student has failed this test! # Load yesterday's workflow and bring up an engine for it. When someone logs into the system to check how Zack did.. The moral of this story is to keep off-site logs and back-ups. Also, workflows are complex but powerful. Adding to the exception and override-based mechanisms, Workflow supports a few signals out of the box if the blinker package is installed. The following exceptions are triggered by the GenericWorkflowEngine . Other than eng.halt , the GenericWorkflowEngine provides more convenience methods out of the box. By calling these, any task can influence the whole pipeline. You can read more about the methods our engines provide at the end of this document. The workflow module also comes with many patterns that can be directly used in the definition of the pipeline, such as PARALLEL_SPLIT. if call(obj, eng):     # if True, continue processing..
tasks while B,C,D... might be still running. know about themselves, they don't see other tasks outside. Subsequently, we can use PARALLEL_SPLIT like this. Note that PARALLEL_SPLIT is already provided in workflow.patterns.PARALLEL_SPLIT . 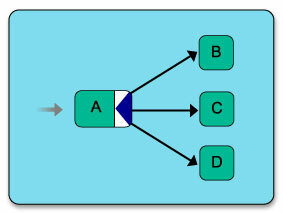 After the execution of task B, task C, and task D, task E can be executed (I will present the threaded version, as the sequential version would be dead simple). After the execution of task B, task C, and task D, task E can be executed. they will be simply executed in parallel. This documentation is automatically generated from Workflow’s source code. Workflow engine is a Finite State Machine with memory. Used to execute set of methods in a specified order. See docs/index.rst for extensive examples. Abort current workflow execution without saving object. Break out of the current callbacks loop. There are possibly many workflows inside this workflow engine and they are meant for different types of objects, this method should choose and return the callbacks appropriate for the currently processed object. This method is part of the engine and not part of Callbacks to grant those who wish to have their own logic here access to all the attributes of the engine. Continue with the next token. Return the currently active DbWorkflowObject. Get name of current task/step in the workflow (if applicable). Override this method to implement per-callback logging. Halt the workflow (stop also any parent wfe ). Halts the currently running workflow by raising HaltProcessing. You can provide a message and the name of an action to be taken (from an action in actions registry). msg (str) – message explaining the reason for halting. action (str) – name of valid action in actions registry. Return whether the engine has completed its execution. Return the appropriate logger instance. Jump to offset calls (in this loop) away. offset (int) – Number of steps to jump. May be positive or negative. Jump to offset tokens away. Any exception that is not handled by the transitions_exception_mapper . Restart the workflow engine at given object and task. Will restart the workflow engine instance at given object and task relative to current state. Execute callbacks in the workflow. indent – int, indendation level - the counter at the indent level is increases after the task has finished processing; on error it will point to the last executed task position. The position adjusting also happens after the task has finished. Skip current workflow object without saving it. Break out, stop everything (in the current wfe ). As the WFE proceeds, it increments this internal counter: the number of the element. This pointer increases before the object is taken. Reserved for the array that points to the task position. The number there points to the task that is currently executed; when error happens, it will be there unchanged. The pointer is updated after the task finished running. Reset callback_pos to its default value. Reset the state of the machine. Reset token_pos to its default value. Callbacks storage and interface for workflow engines. The reason for interfacing for a dict is mainly to prevent cases where the state and the callbacks would be out of sync (eg by accidentally adding a callback to the beginning of a callback list). Insert many callable to the stack of thec callables. Remove non-callables from the passed-in callbacks. Tuples are flattened into normal members. Only lists are nested as expected. Remove tasks from the workflow engine instance, or all if no key. Return callbacks for the given workflow. Replace processing workflow with a new workflow. Helper for storing signal callers. Call the workflow_error signal if signals is installed. Call the workflow_finished signal if signals is installed. Call the workflow_halted signal if signals is installed. Call the workflow_started signal if signals is installed. Adds a SQLAlchemy database model to save workflow states and workflow data. Overrides key functions in GenericWorkflowEngine to implement logging and certain workarounds for storing data before/after task calls (This part will be revisited in the future). Return the objects associated with this workflow. Save the workflow instance to database. Define the known workflow statuses. Specify the known object statuses. Drops setVar() , getVar() , delVar() and exposes the engine.store dictionary directly, with an added setget() method that acts as getVar() . Renames s/getCurrObjId/curr_obj_id/ and s/getCurrTaskId/curr_task_id/ which are now properties. Also renames s/getObjects/get_object/ which now no longer returns index. Removes PhoenixWorkflowEngine. To use its functionality, the new engine model’s extensibility can be used. Moves processing_factory out of the WorkflowEngine and into its own class. The majority of its operations can now be overridden by means of subclassing WorkflowEngine and the new, complementing ActionMapper and TransitionActions classes and defining properties. This way super can be used safely while retaining the ability to continue or break out of the main loop. Moves exceptions to errors.py . Changes interface to use pythonic names and renames methods to use more consistent names. WorkflowHalt exception was merged into HaltProcessing and the WorkflowMissingKey exception has been dropped. Renames ObjectVersion to ObjectStatus (as imported from Invenio) and ObjectVersion.FINAL to ObjectVersion.COMPLETED. Introduces SkipToken and AbortProcessing from engine_db . Adds support for signaling other processes about the actions taken by the engine, if blinker is installed. Moves callbacks to their own class to reduce complexity in the engine and allow extending. Updates all staticproperty functions to classproperty to have access to class type and avoid issue with missing arguments to class methods. Re-raises exceptions in the engine so that they are propagated correctly to the user. Replaces _i with MachineState , which protects its contents and explains their function. Allows for overriding the logger with any python-style logger by defining the init_logger method so that projects can use their own. Splits the DbWorkflowEngine initializer into with_name and from_uuid for separation of concerns. The latter no longer implicitly creates a new object if the given uuid does not exist in the database. The uuid comparison with the log name is now reinforced. Includes the code created by Roman Chyla, the core of the workflow engine together with some basic patterns. Raja Sripada <rsripada at cern ch> contributed improvements to the pickle&restart mechanism. Workflow is free software; you can redistribute it and/or modify it under the terms of the Revised BSD License quoted below. Copyright (C) 2011, 2012, 2014, 2015, 2016 CERN. Workflow was originally developed by Roman Chyla. It is now being developed and maintained by the Invenio collaboration. You can contact us at info@inveniosoftware.org. How do I use Workflow?